While the holiday season is often depicted as a special time of year -- so much so that many people strive to make their holidays "perfect" -- the reality is that the happiness that is widely portrayed can often be a myth for people across Canada, including young people. And if Christmas seems like it's starting earlier every year, it's because it is; the term "Christmas creep" was coined in the 1980s in reference to the retail industry's early start on holiday marketing. In 2013, 49 per cent of marketers said they would launch holiday campaigns before Halloween . When some of us think about kids at Christmas, we might think of the anticipation of Santa, the rattling of presents under a tree, and the excitement on Christmas morning. But there are many young people who don't celebrate Christmas, or whose families can't afford to. Yet holiday marketing isn't the only thing that comes around early; it's not uncommon for kids, teens and young adults across Canada to start showing signs of holiday-related stress as early as mid-November. When kids learn early on that the holidays are supposed to be picture-perfect family gatherings filled with gifts, they also need to learn how to cope with their feelings during this time of year. What can kids can do if their expectations aren't met? How will they give a gift to a friend or family member that's not met with appreciation? How can parents be there for kids who might experience sadness, loneliness or anxieties at a time of year that is supposed to be joyful? It's important for young people to be reminded that just because the holidays are here doesn't mean our emotions take a holiday. "Well my story just begins around September and life just got harder since... My parents started to talk about divorce and Christmas is when my dad leaves. He only wants to celebrate Christmas with us and then he leaves like that's gonna make anything any better... Well I'm just feeling lonely... and well Christmas was just supposed to be the best holiday and it wasn't supposed to make me feel this way so what should I do... wht could I do..."
Changes in the family like divorce or separation, the loneliness of being separated from friends over the school holiday, stress related to budgeting, and the pressure of family obligations and traditions can all have an impact on kids' mental and emotional well-being at this time of year. Don't underestimate how a busy family schedule can blended family can impact your kids. You may be looking at hectic schedules, new routines, more obligations, change of traditions, and lots of time travelling between gatherings and get-togethers. Involve the kids and lay out the schedule in advance to ensure they feel acknowledged, and remind them that you are there to talk, no matter how busy things get. High expectations, pressure and financial strain of the holidays also have an impact on young people. As society continues to focus on individualism and materialism, young people can feel increasingly motivated toward goals related to social status and image as compared to previous generations. Some young people can worry about being left out at school if they don't have the latest hi-tech gadget or a coveted brand name piece of clothing. The pressure for young people to keep up with peers in this way can impact kids' self-esteem, making them feel as though their sense of worth is grounded in material goods. Other kids might find it hard to reconcile what they see and hear about the holidays when their families' own religious or cultural traditions are celebrated differently. 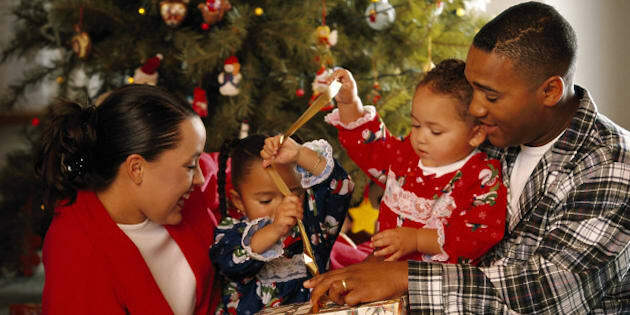 Parents have the ability to shift the focus about what the holidays mean. Instead of talking to kids about what they would like to receive, why not talk about what they would like to give? You could also go one step beyond and talk about how you can all give back as a family through volunteering or making a charitable donation. And being mindful of how you talk about giving and receiving at this time of year can make a difference, too. Help your kids understand the meaning of gratitude, and demonstrate it for them. Help them see what it means to appreciate a gift from another person rather than disappointment. Whatever the source of stress is for young people, their emotions are very real, and adults should stay aware of the signs that a kid might be struggling. A young person who becomes withdrawn, moody, or depressed could be showing symptoms of holiday stress. Find a way to communicate with your kids about what's coming up in December. Take a walk after dinner, or treat the kids to a hot chocolate and ask them how they are feeling about the holidays. How can you create a new family tradition, or relax together as a way to balance your schedule? Baking cookies together or planning a family movie night can help take the pressure off. If your kids tell you they want some time alone over the holidays, maybe to read or just relax, listen to what they are telling you and give them the space they need. Extra chores, play dates, and family get-togethers can become overwhelming and can make kids feel over-scheduled. It's also important for parents to pay attention to their own stress. If you have a lot on the agenda, you might want to designate some quiet time for the whole family to ensure you all get the break you need.